Indian fishermen prepare to leave the beach during rain and strong winds caused by cyclonic storm named Titli, or Butterfly near Gopalpur on the Bay of Bengal coast, Ganjam district, eastern Orissa state, India, Oct.11, 2018. These photos capture communities persevering despite all odds. From devastating impact of natural disasters to refugee children committed to getting an education, these photos show why it's more important than ever to commit to achieving the Global Goals. You can join us in taking action here. Natural disasters struck communities across the globe this week. The United States saw major devastation after Hurricane Michael, a Category Four cyclone, hit the Florida Panhandle and coastal areas in Virginia. The storm, the strongest to hit the US since 1969, has shut down power for 1.6 million people across six states, bulldozed entire towns, and taken at least 13 lives since making landfall on Wednesday. 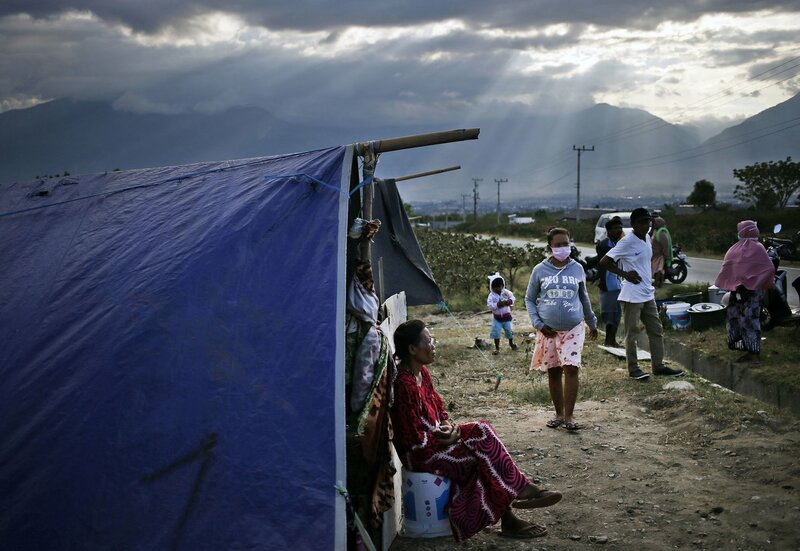 The pain affected communities are feeling is shared by many on the other side of the world in Indonesia where people are also experiencing immense loss in the aftermath of a recent earthquake, tsunami, and multiple mudslides. The succession of disasters has killed 2,073 people and thousands more are still be missing, Channel News Asia reports. Despite frequent extreme weather events, Indonesia allocates just 0.002% of its total budget to disaster preparation and recovery funds. Still, communities are showing their resilience in the face of these natural disasters. That same resilience is seen among Syrian refugee children trying to continue their education, despite their challenging circumstances. On Thursday, members of the LGBTQ community celebrated National Coming Out Day — a day that celebrates people's freedom to express their gender and sexual identity. Though the day is one of joy, it is also a reminder of challenges overcome and perseverance for many. These are some of this week's most powerful and thought-provoking images. 1) Earthquake in Indonesia: Earthquake survivors spend their afternoon outside their tents in Palu, Central Sulawesi, Indonesia, October 9. A 7.5 magnitude earthquake rocked Central Sulawesi province on Sept. 28, triggering a tsunami and mudslides that killed a large number of people and displaced tens of thousands of others. 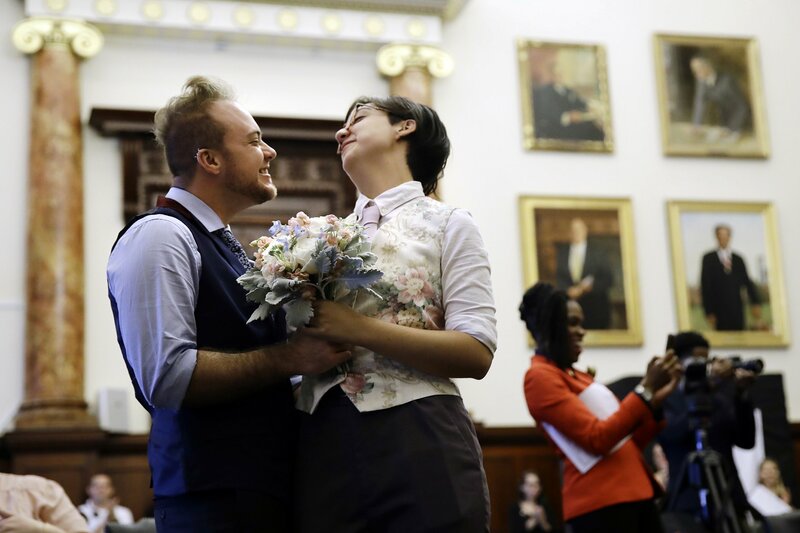 2) National Coming Out Day: Emmett Binkowski and Maggie Alvarez embrace after exchanging wedding vows at an event marking National Coming Out Day, at City Hall in Philadelphia on Oct. 11. 3) World Breastfeeding Week: A woman nurses her baby, during a public event to promote the benefits of breastfeeding, during the World Breastfeeding Week held in Palma de Mallorca, on Oct. 7. 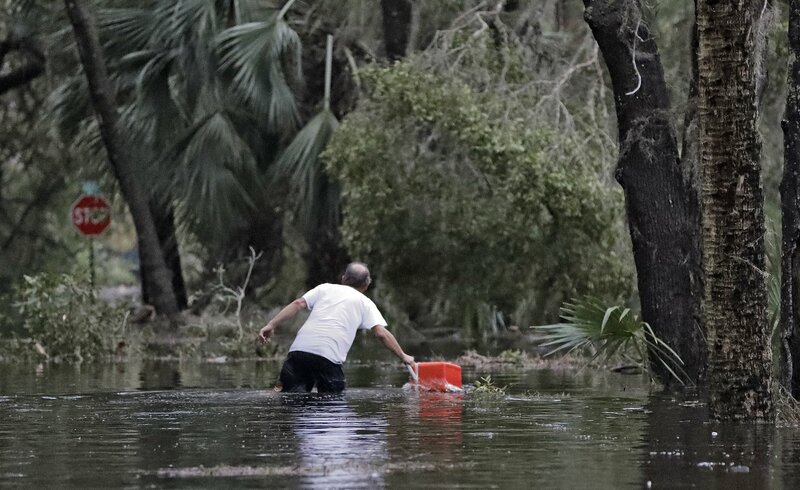 4) Hurricane Michael: A resident of St. Marks, Fla., rescues a cooler out of the floodwaters near his home on Oct. 10. Powerful Hurricane Michael slammed into the Florida Panhandle with terrifying winds of 155 mph Wednesday, splintering homes and submerging neighborhoods before continuing its destructive march inland across the Southeast. It was the most powerful hurricane to hit the continental US in nearly 50 years and at least one death was reported during its passage. 5) Human Tower: Members of the "Colla Joves Xiquets de Valls" complete their human tower during the 27th Human Tower Competition in Tarragona, Spain, on Oct. 7. 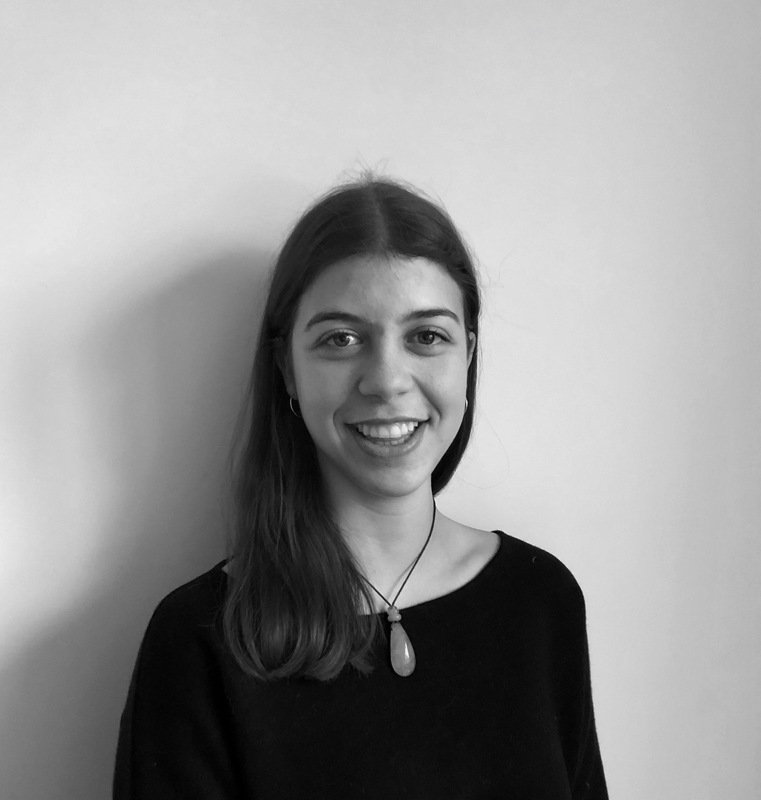 The tradition of building human towers or "castells" dates back to the 18th century and takes place during festivals in Catalonia, where "colles" or teams compete to build the tallest and most complicated towers. 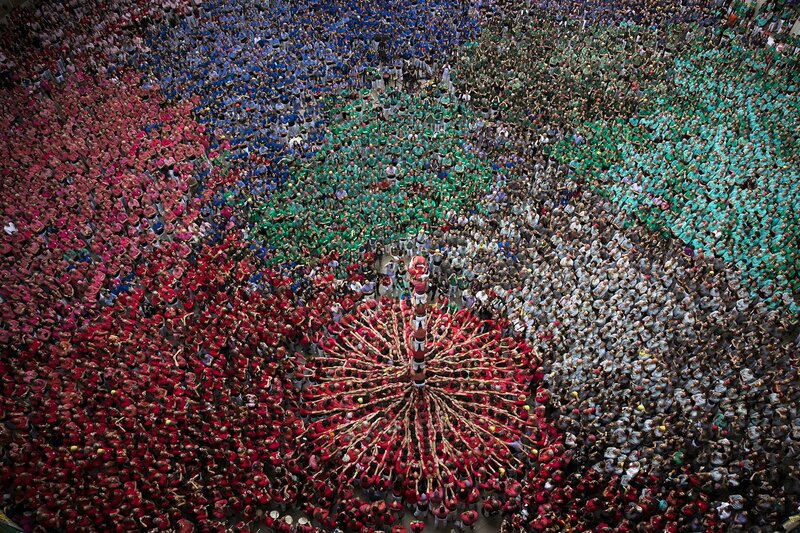 "Castells" were declared by UNESCO one of the Masterpieces of the Oral and Intangible Heritage of Humanity. 6) Education Protests in Colombia: A university student shouts slogans during a march in demand of budget increase for the Colombian tertiary education, in Cali, Colombia, on Oct. 10. 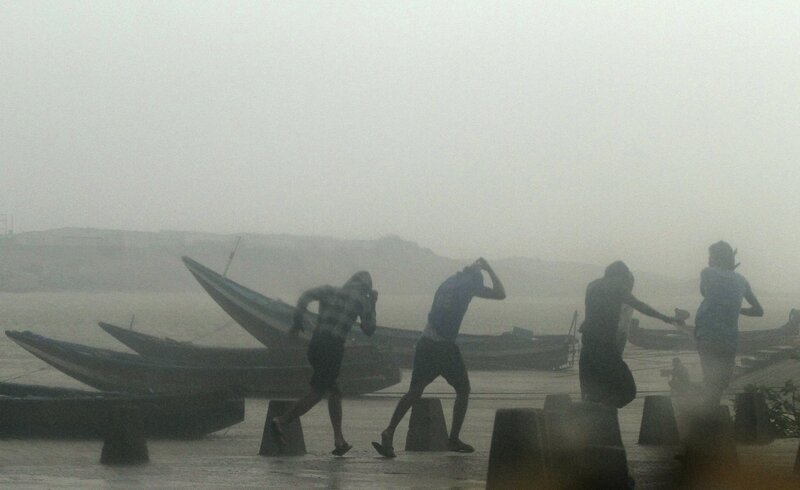 7) Typhoon in India: Indian fishermen prepare to leave the beach during rain and strong winds caused by cyclonic storm named Titli, or Butterfly near Gopalpur on the Bay of Bengal coast, Ganjam district, eastern Orissa state, India, on Oct. 11. The severe cyclone damaged mud huts and uprooted trees and electric poles Thursday in eastern India where authorities have moved nearly 300,000 people to higher ground. 8) Deadly Earthquake and Tsunami Hits Indonesia's Island of Sulawesi: Tina stands in a damaged area waiting for news of her daughters Marsha and Keila as they search for victims in Balaroa village following the earthquake on Oct. 11 in Palu, Indonesia. The official search for victims from the devastating earthquake and tsunami on the Indonesian island of Sulawesi began winding down on Thursday as death toll climbed past 2,045 and officials warn another 5,000 people remain missing and feared buried in mud and rubble. Indonesian authorities said this week that any bodies unearthed will likely be decayed beyond identification while efforts will shift focus to those injured by the disaster and the displaced. 9) Education in Syria: Syrian children who fled with their families from the northern countryside of Hama, are pictured in a classoom at the makeshift school of 'Zuhur al-Mustaqbal' (in Arabic 'Flowers of the Future') in al-Jeneinah camp for displaced people in the village of Atme, in Syria's mostly rebel-held northern Idlib province, on Oct. 10. 10) Hurricane Michael Slams Into Florida's Panhandle Region: An American flag battered by Hurricane Michael continues to fly in the in the rose colored light of sunset at Shell Point Beach on Oct. 10 in Crawfordville, Florida.The hurricane hit the Florida Panhandle as a category 4 storm.